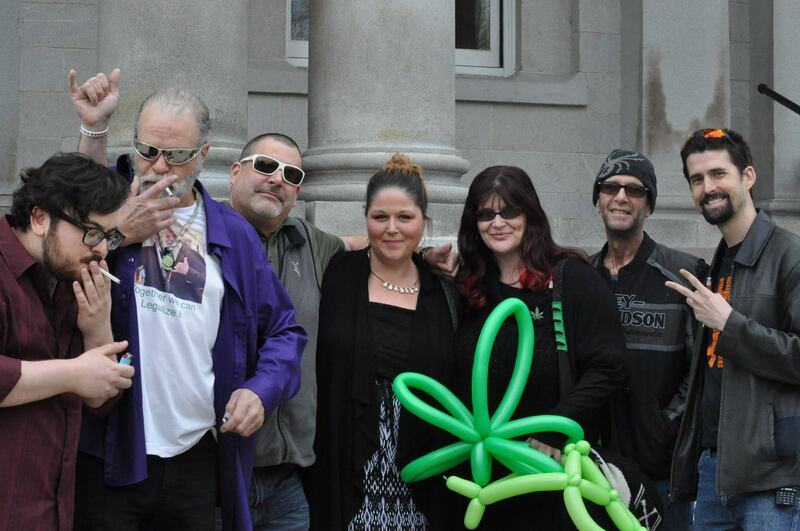 Several longtime cannabis freedom activists at the 2017 Concord smoke-out. 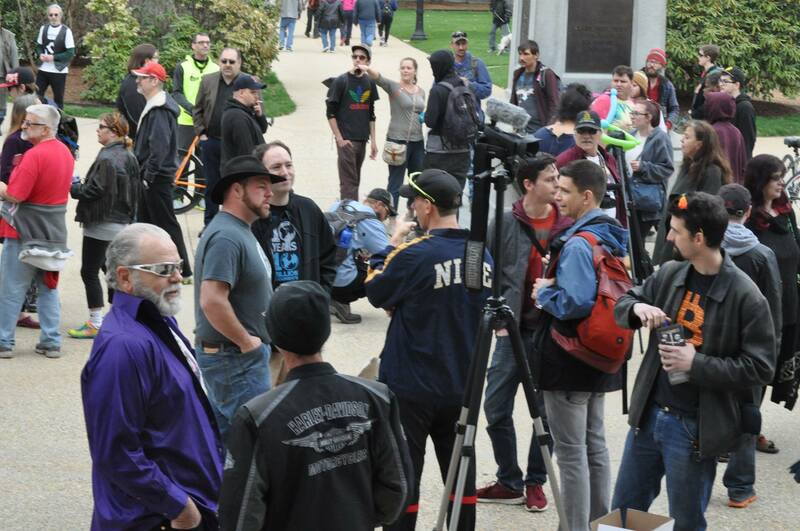 Since 2009, on April 20th at 4:20pm people from across New Hampshire gather in front of the State House in Concord to commit mass civil disobedience by smoking, vaporizing, or otherwise consuming cannabis in public. As has happened in previous years, we were again joined by multiple state representatives including Libertarian Caleb Dyer of Pelham, NH as well as Keene’s Ward One Democrat, Joseph Stallcop, and Republican Glen Aldrich of Gilford. This year’s event began with speakers at 3pm including representatives Dyer & Stallcop, me explaining the right of Jury Nullification, and Libertarian Party of NH chairman Darryl W Perry. The overcast weather threatened rain which thankfully never materialized and the temperature was cool and pleasant with a couple dozen already in attendance at 3pm by the street, smoking cannabis and chalking messages on the pavement. As we closed in on 4:20pm (the time that cannabis is used in celebration globally) the numbers of attendees swelled to easily over 100 people. New Hampshire bitcoiners were also scattered throughout the 420 rally, celebrating the same-day NH senate vote of 13-10 to pass the Bitcoin protection bill on to governor Sununu. With cannabis decriminalization passed by a record 89.8% of the NH house, it is widely expected to finally make it through the senate and new governor this year. In other cannabis-related political news, major expansion of the medical cannabis qualifying conditions also seems to be making good headway as well, with conditions like chronic pain and post-traumatic stress disorder possibly being added to the list. Will republican governor Sununu prove to be more compassionate on this issue than his democrat predecessor? Remember, this is New Hampshire, where political labels don’t always mean what you think they mean. Can anyone identify this cop watching the event? While mainstream media news reporters present seemed to be limited to the Concord Monitor’s Allie Morris, the police were definitely watching, with what many suspected to be a police drone surveilling from above during the main event at 4:20. While one could say the drone being police-operated is speculation, there was definitely an unmarked police SUV parked and observing the crowd early on in the event. After I noticed him sitting there, I walked over to the grass near where he was sitting and pointed my camera at him. 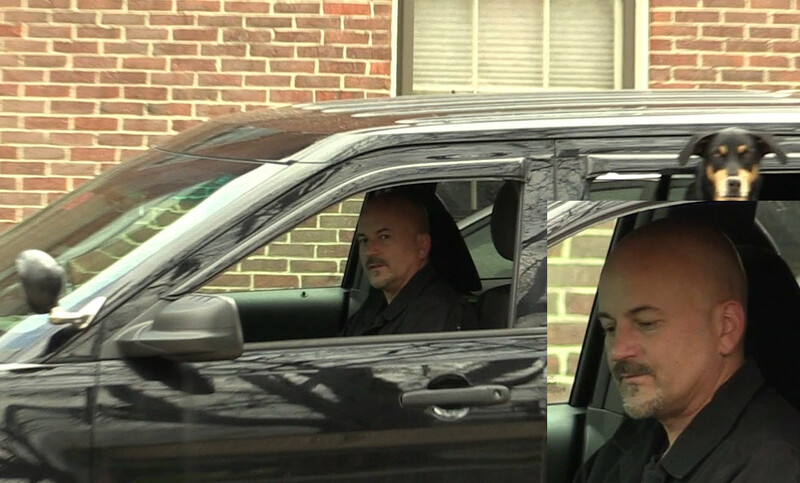 Within a minute, he said something into a microphone, rolled up his window and left, not to return. Besides a few state police cruisers driving by (not unusual for downtown Concord), that was the extent of any obvious police presence. As has been the case over the eight years of this epic civil disobedience event, no one was arrested. Overall, the event was fantastic with plenty of people, great speakers, good weed, conversation, and camaraderie. The future looks bright for cannabis in New Hampshire, especially as more liberty-oriented activists migrate here as part of the Shire Society and Free State Project. If you care about freedom and want help make it happen, you should really consider moving here ASAP. Here are over 101 Reasons Why Liberty Lives in New Hampshire. Stay tuned here to Free Keene for the latest on ending prohibition in New Hampshire. More rhetoric. It didn’t look like there were “hundreds” of people not to mention not all were smoking marijuana. “21” years as a stoner lawyer? Way too funny. She hasn’t done anything in those 21 years so that is proof enough marijuana damages hopes and dreams. Now Jacks, don’t you suppose that people’s hopes and dreams might also be dashed because irrational sorts like yourself want to throw them in prison simply for engaging in peaceful activities that you’re too set in your ways to appreciate? We smoke these in remembrance of lost liberties, and in hope for a day when the people don’t fear their government, because the government fears the PEOPLE! You guys are so cool! Actually not really, 4:20 rallies are so yesterday. Do you have any new material to work with. Marijuana consumption is not a big deal anymore. Your cause is very outdated. Bravo, KC darling! But since you’ve brought it up, isn’t offering a compliment and then sarcastically taking it back a practice that’s fallen out of fashion as well? I’m wondering if it is missing from the uploaded video/didn’t get recorded somehow as I’m pretty sure I heard that on 4/20. I know some of the speeches an hour or hours earlier and then more just before 4/20.